Chloe-Lee hit the big O-N-E this past Monday (for her birth story, click here). We came into St. Catharines on Friday and Friday night Chloe, Kevin, Dad, Sue, Aunt JoAnne, Aunt Lori and I all went to Kimonos in Welland and had an excellent time. Even the staff got into the swing of things, signing one of Chloe's birthday cards in Chinese. Seeing Chloe's name in a different language is awesome. Chloe got her first taste of birthday cake and proceed to share it with the floor, table and I'm pretty sure the couple sitting behind us. 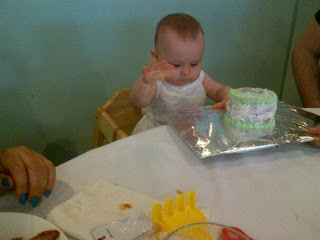 At one point she even pushed her face into the cake which was hilarious! Sunday we had a bigger party at my parents place. The week previously I had decided to build Chloe a birthday tutu, make ti-colored pennants and hand make the party favors; personal pinatas. I don't think I realized just how much I had bitten off but thankfully my fantastic Aunt Dana (along with Kev) cut out all the pennants and Margie, the absolute ANGEL that she is, pieced together the tutu while I made Chloe's Birthday cake and cupcakes (which Margie also helped decorate till past 2am!). Chloe spend a good portion of her birthday in the pool, wee waterbaby that she is and even tuckered herself out enough to fall asleep in my arms while we floated and nursed in a waterchair. It occurred to me while Chloe and I were just floating/nursing that a year ago I couldn't see to her first birthday, I was so in awe of just her having been there, in that moment of time and I'll tell ya, it was the best part of her whole birthday, just the two of us floating along. Monday we headed to Kitchener for Chloe's last Roots of Empathy class. I am so, so grateful to have gotten the opportunity to be apart of such a fantastic program. I highly encourage anyone to look into if it's in their community if they have wee'un. What a blessing. The children had put together speeches, an insanely difficult scavenger hunt with a dang near impossible secret code called PigPen, gave letters, a ROE Teacher shirt for Chloe and a whole bunch of letters and drawings. My aim is to make a scrapbook for Chloe, to show her just how loved she was by these kids. Unfortunately we weren't able to get any visiting in with our friends in Kitchener. I'm hoping to fix that the next time I swing up there. On a more serious note, Chloe started Prednisone today. She's on a high dose (20ml x2 day) and so far so good. She has to take it in conjunction with the Sabril. It kills me that my baby has had to be so deeply medicated so early in life but I also acknowledge the necessity of the meds. We have another EEG and consult arranged in 3 weeks and Lord willing we will see a vast improvement in Chloe's EEG. Please, for my friends who pray, we ask that you would pray that God would heal Chloe from these spasms and that her brain would be fine and untouched. Also, that Chloe would be spared any of the side effects from the Sabril and Prednisone. Happy Birthday Baby Chloe!! It looks like all the festivities went "swimmingly" (pun intended). I miss you all so much, and I think about you and pray often. If it makes you feel better Cody, I was on prednisone as a toddler and later as a child and it all worked out okay. I hope it all works for you guys! A year already eh? Wow time sure does fly by! Chloe is definitely in our thoughts and we trust the medication will work for her.